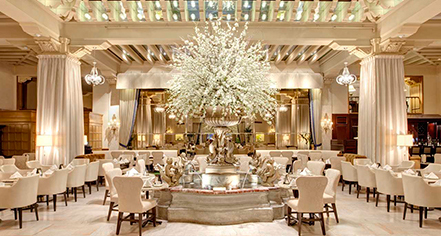 Centered around its sparkling, iconic fountain, the historic Palm Court boasts majesty and luxury. Radiating a regal atmosphere, the Palm Court is the ideal setting for Afternoon Tea, a tradition introduced in 1840 by the Seventh Duchess of Bedford. Since its establishment, The Drake Hotel has been recognized as the quintessential meeting spot for luminaries and members of the social elite. Princess Diana, Queen Elizabeth, and the Empress of Japan have all been seen in the Palm Court. Guests can experience traditional Afternoon Tea by sipping on Palm Court’s own blend of custom-made tea while enjoying an arrangement of finger sandwiches, breads and scones, and French pastries. The Palm Court is happy to accommodate dietary needs, including vegetarian and gluten-free menus. Daily, 1:00 p.m. to 5:00 p.m. Guests can enjoy Afternoon Tea accompanied by heavenly sounds of a live harp dancing in the background. Wednesday – Friday, 2:00 p.m. –​ 4:30 p.m.
Saturday –​ Sunday, 1:00 p.m. –​ 5:00 p.m. 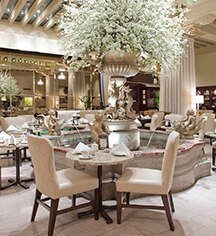 The Palm Court is an ideal pre-dinner meeting place or post-work cocktail hot spot. Menu selections includes soups, salads, sandwiches, and desserts. The bar features a large selection of imported beers, spirits, and cocktails made with premium mixers. Sunday – Thursday, 1:00 p.m. – 10:00 p.m.
Friday - Saturday, 12:00 p.m. – 1:00 a.m.
Friday - Saturday: 9:00 p.m. – 12:30 a.m.